Pressure-resistant even when installed beneath a driveway surface: the drainage element Stabilodrain® SD 30. 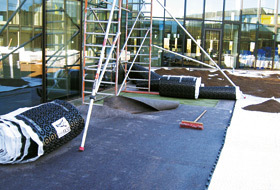 Fixodrive® FX 50 laminated rolls provide the foundation for the green roofs on the courtyards. 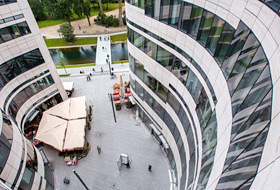 Koe-Bogen, the luxury shopping and office mile in the heart of Duesseldorf, the capital of North Rhine-Westphalia, Germany, is shaping the cityscape. It is not only the innovative design of this six-storey complex created by Daniel Libeskind that is extraordinary but also the fact that it has been awarded LEED Platinum Certification for sustainable building. The green design plan includes about 4000 m² of extensive green roof at a height of 26 m, about 1500 m² of roof garden for each of the green courtyards on the third and fourth storeys and 1200 m² of paving for the forecourt at ground level, above the underground garage. Greenery has also claimed its place in the bizarre incisions in the façade, enabling these “permeated green cuts” to bring the adjacent green courtyard into the building. 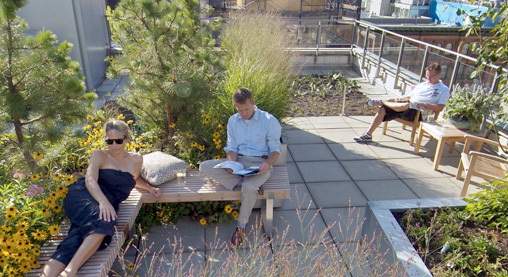 The concepts have all been a huge success thanks to the use of the appropriate ZinCo green roof technology. 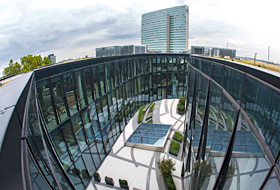 In assuming Koe-Bogen from the project developer “the developer“ Projektentwicklung GmbH, Cologne/Duesseldorf, the current owner, Art-Invest Real Estate, has acquired a prestigious property. This contemporary and highly-functional building complex consists of a shopping area and restaurants across three levels, three levels with office space and an underground garage also over three levels. The name Koe-Bogen is taken from the arc (Bogen) that is drawn by the street on the boundary of the Hofgarten park towards Koenigsallee (Koe) street. The two buildings connected by a bridge take up the contour of the Hofgarten to the North and follow the building line to the West of the Koenigsallee. 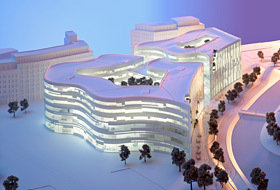 To the South and East, the building complex discloses an undulating curved silhouette. The passageway between the buildings allows direct access to the quiet zones of the Hofgarten and the Landskrone lake. In addition to the very special shape of the building, the façade made of glass, white stone and greened diagonal “cuts” speaks its very own language. It is joined by contemporary roof gardens with plant beds set among the patterns made by paving stones, and expansive green roof areas. “Buildings – contrary to popular belief – are not inanimate objects. They live and breathe and, just like us people, they have an inner and an outer self and a body and a soul”, according to the philosophy of the architect, Daniel Libeskind. The work of the New Yorker can be seen worldwide and ranges from museum buildings, convention centres, universities, hotels and shopping malls to residential projects. What sets his designs apart is that the buildings are represented as having their own identity within their given cultural context. Usable open space for the building of Koe-Bogen became available once parts of the infrastructure for trams and cars were relocated below ground. The contractors were faced with a considerable challenge regarding the logistics of the project, due to the fact that the first stages of the civil engineering projects, i.e. tunnel construction, the reinstatement of the former elevated road and the creation of a pedestrian promenade, coincided with the timing of the structural engineering project, the building of Koe-Bogen. 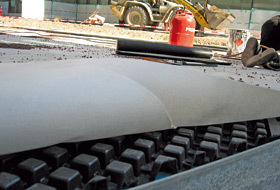 The foundation for all the roof areas of the Koe-Bogen complex is a root-resistant, bituminous roof waterproofing membrane, regardless of whether it’s for the “warm” roofs of the buildings and the inner courtyards or on the “inverted” roof of the underground garage, where the waterproofing is protected beneath the thermal insulation layer. 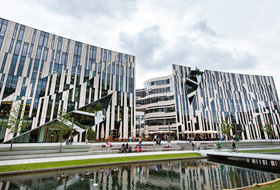 ZinCo provided tailor-made solutions, from extensive to intensive green roof to forecourt surfaces for pathways and driveways, to suit each individual building in the Koe-Bogen complex for each type of individual use. The drainage and water storage element Floraset FS 50 is the core element of the build-up used for the approx. 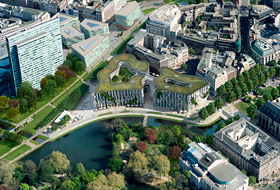 4000 m² of extensive green roof in the building complex. The Floraset® FS 50 elements made from expanded polystyrene (EPS) are particularly suited for such large roof areas with minimum pitch and lengthy drainage routes, where puddles can be expected to form. The installation of 50 mm high elements with their underlying, continuous channel system, ensures the required elevation over the standing water . On the upper side, water retention cells provide for a supply of water suited to the given plants and the openings ensure diffusion and aeration. Transport and handling on the building site is not a problem given the light weight of the Floraset® FS 50 elements. The system filter SF is installed over the drainage layer and this is followed by 8–10 cm of substrate. 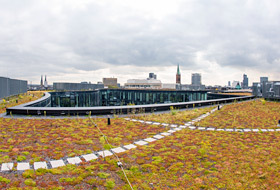 Pre-cultivated vegetation mats were installed around the areas at the roof edge due to the wind suction at an altitude of 26 m, and Sedum cuttings were sown in the other areas. Just one year after sowing, full coverage has been achieved, as can be seen in the recent photos. 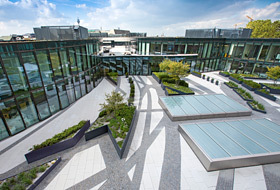 The two courtyard roofs that make up the 1500 m² of intensive green roof is each a work of art in itself, with a linear paving pattern, created using large-size, light and dark paving stones and a wide variety of plant beds in many sizes, heights and shapes, incorporated into the areas between the paved areas. The ZinCo drainage mat Fixodrive® FX 50 is a permanently reliable basis for the stylish design. As it is supplied as a pre-laminated roll, quick installation is guaranteed. A good, solid bond is made thanks to the interlocking studs along the long side, allowing for drainage across the entire area beneath the green and paved areas. 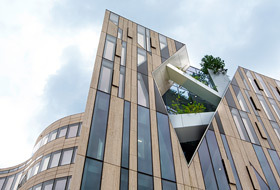 The Duesseldorf landscape architect, Sebastian Fuerst, worked together with Daniel Libeskind on these unique roof gardens with their plants from native grasses, ferns, perennials, bushes and small trees, just as they did for the five diagonal “permeated cuts” in the façade. The permeated cuts are on the north and western elevations of the buildings and cut cross a number of storeys. Within the five metre wide and two metre deep “cuts” there are additional sloped levels. The permanent growth of the evergreens and the robust plants that were chosen is ensured thanks to the drainage and protection mat Fixodrain® XD 20, in combination with varying substrate depths, underground anchoring of the bushes as protection against erosion and wind suction, automatic irrigation, fertilisation, heating and lighting. An area of about 1200 m² of the forecourt is actually roof area as it is situated directly above the underground garage. Given that not only pedestrians but also vehicles such as delivery vans and emergency service vehicles will be using this area, the paving structure had to be designed to carry the required loads. The extremely pressure-resistant drainage element Stabilodrain® SD 30 is ideal for use beneath driveways, particularly on inverted roofs: it is vapour diffusive and therefore allows moisture to diffuse out. Koe-Bogen was awarded the prestigious MIPIM Award for “Best Urban Regeneration Project” in March 2014, in Cannes. This award is referred to as the “Oscar of the real estate sector”. Six months later, the building was granted certification according to the American system “Leadership in Energy and Environmental Design” (LEED), at the highest classification level: LEED Platinum. This internationally-recognised, sustainable building standard is awarded by the US Green Building Council. The decisive factors in this certification award were, among others, resource-conserving building, the use of renewable energy and heat recovery and also the 47 % proportion of green area of the overall project. 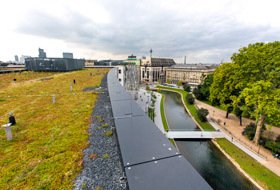 The extensive green roof, in particular, provides a large water infiltration area and, therefore, a high level of water retention. 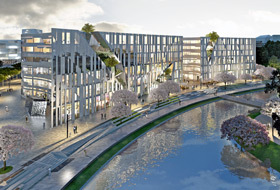 Koe-Bogen is the first milestone and a prestigious example of the many activities that are required for the creation of a contemporary urban setting in downtownDuesseldorf.